Vilfredo Pareto: Free Trade economist who believed in the importance of elites. I’ve posted a number of piece criticising the attempts by Conservatives, such as the Dorset MEP Daniel Hannan, to smear Socialism through the argument that Fascism was simply one form of it. American Conservatives in particular seem to believe that any form of state intervention or collectivist approach automatically equals Socialism, which is in turn equated with Communism and Nazism. Mussolini started his career as a radical Socialist, and there were elements of Socialism, and specifically Syndicalism, in Fascism. Fascism was, however, an unstable and frequently incoherent mixture of different and contradictory ideologies and attitudes. Syndicalism was one element. Others were the middle class, Conservative ideologies of free trade, private enterprise and liberismo. Liberismo was the ideology of the Italian middle classes. It was associated with the belief in a balanced budget and sound, stable currency, and reflected the interests of the middle class groups with fixed incomes, who felt themselves vulnerable to inflation. These were rentiers, pensioners, civil servants, professionals and White collar workers. These groups looked to Fascism to halt rising prices. At the same time, Mussolini presented the Fascist movement as defending private enterprise and the small businesses from Socialism and organised Labour on the one hand, and the large trusts and cartels of big business on the other. They resented the way the government, under their influence, had maintained a policy of high tariffs and high state expenditure. The Italian Nationalists, who later merged with the Fascists, had attacked international finance and the major banks. The crash of the Banca di Sconto associated with the Perrone brothers and the Ansaldo conglomerate in 1922, resulted in a number of small investors losing their savings. The Perrone brothers and Ansaldo were major figures and backers of the Nationalists, who blamed their bank’s failure on the government blindly obeying the dictates of the rival Banca Commerciale. 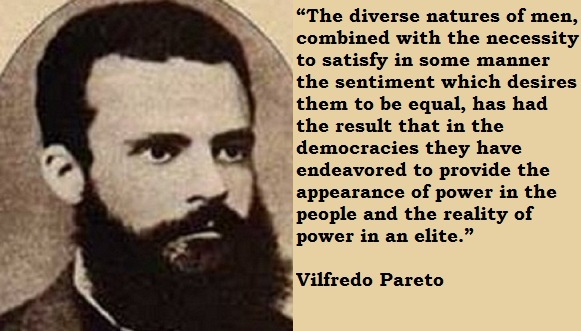 Fascist elitism and contempt for democracy also had part of its origins in the ideas of the economist Vilfredo Pareto. A professor of Political Economy at the University of Lausanne, Pareto was a staunch supporter of free trade. This in turn led to his contempt for parliamentary democracy and belief in the importance of elites. He also valued myth, considered as powerful irrational ideas and images, as a means through which governments and movements could inspire their supporters to action. His works also explored the use of force and consent. He argued that the ‘foxes’ of the old, patrician order, would now be overthrown by ‘plebean’ lions, and denounced the humanitarianism of contemporary liberal politics as a symptom of a political order in decline. As the above quote makes clear, Pareto believed that contemporary democracy was merely an ideological disguise for the way the elite continued to hold power while maintaining the impression that it was the masses who were in control of government. Mussolini read Pareto when he was a radical Socialist, and took over his idea elitism, and utter contempt for parliamentary democracy and humanitarianism. Free trade, private enterprise, and a balanced budget, became elements of Fascism. This is, however, denied by Conservatives, who seem to believe that they stand apart from and opposed to it in a way which the Socialist parts of Fascism do not. Liberismo and Pareto’s elitism may also explain the strongly anti-democratic trend in Libertarianism. Both von Hayek and Mises served in Vollmar Dollfuss’ Austro-Fascist regime. Dollfuss banned the Austrian Socialist party on the grounds that it was preparing a revolution. It’s unclear whether this was true, or merely a pretext. The regime was allied to Mussolini’s Italy, and looked to the Duce for protection against annexation from Hitler’s Germany. After Hayek moved to America, he also travelled to Chile after Pinochet’s coup to examine the implementation of his economic doctrines there. Pareto’s prediction of the victory of the plebs over the patricians may well have been another piece of myth-making – a powerful image intended to inspire fear in the middle classes, and force them to act against the threat from the working class. Hayek in his absolute support for private enterprise, free trade and willingness to serve Right-wing dictatorships, seems to have shared these attitudes. This is despite Libertarianism’s claim to represent traditional Liberalism. Libertarianism and its adherents share the same attitudes as the Conservative followers of liberismo who joined the Fascists. For further information, see ‘Pareto, Vilfredo’, in Philip V. Cannistraro, ed., Historical Dictionary of Fascist Italy (Westport: Greenwood Press 1982) 392. Adrian Lyttelton, The Seizure of Power: Fascism in Italy 1919-1929 (London: Weidenfeld & Nicolson 1987).